Welcome! I sincerely hope you will find someone of "interest" here. I have tried to be as accurate as possible but mistakes can and do happen. Should you notice an error, please send an email and it will be corrected. Some of my research has been taken from various sources, the internet included, and has not been verified, sources are available upon request. I urge you to do your own research for verification. Let's all do our part to help eliminate the myriad of false information so readily copied and re-copied. And remember, what is recorded on various documents isn't always the truth! This research is on-going, so please check back frequently to see what is new. DO NOT USE MY DATA/STORIES/PHOTOGRAPHS WITHOUT MY CONSENT - THIS INCLUDES CUTTING AND PASTING/SNAPSHOTS OF THE DATA AS WELL AS THE PHOTOGRAPHS, DOCUMENTS AND NEWSPAPER CLIPPINGS. 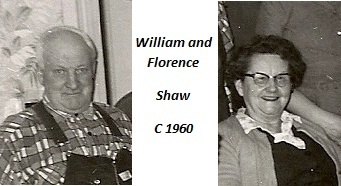 An enormous debt of gratitude is owed to: Donna Milsted-MacKay for the Milsted family photographs and information; Lila (Shaw) Campbell, who unselfishly shared the Shaw information she had - recipes included; Aunt Donna for photo's; Suzanne Frantz, for her willingness to share her Hebner information; D. Cox for her wealth of Milsted/Cockett information, photo's, documents and stories! Special thanks to the following people for the data and photographs on the McKelvey line: Dave Walker, Linda Pelletier, and Samantha Maclean. Please contact them for further information. To start, click on one of the following ancestors, search for a name in the surname index, or use the search engine below. WARNING: The Schell Lines are suspect ~ more research is needed. Sources are available on request.